Instead, the couple allege, the company wanted to complete the project quickly "under part of a broader and very lucrative contract with the U.S. government." "Both DAI and the U. S. government ignored Mr. Gross' repeated security concerns," the suit charges, "so that DAI could continue to generate significant revenue and the government could continue to use Mr. Gross as a pawn in its overall Cuba policy initiatives." Gross, his lawyers and family say, is battling chronic arthritis pain and "what appears to be a cancerous tumor beneath his shoulder blade. His business and career have been destroyed, and his family has been deprived of their primary wage earner." 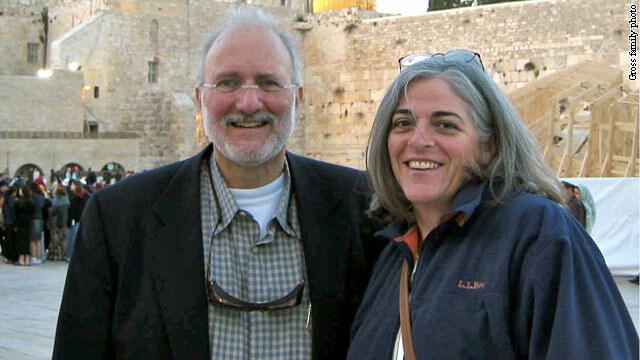 In September, the Cuban government disputed reports that Alan Gross' health is failing. A spokesman for DAI said the group is disappointed that the lawsuit was filed, calling Gross "a colleague and friend whom we respect." "As much as we would like to address the numerous disagreements we have with the content of the complaint, the fact is that doing so will not advance the cause of bringing Alan home, which remains our highest priority," said Steven O'Connor, director of communications for DAI, in a statement e-mailed to CNN. "We are confident that we will have a chance to tell DAI's side of this story in due course." Not one ounce of sympathy for either of them. Not sure why ppl slam this guy, I'd say he was an unsuspecting gov pawn; just very disappointed the Cubans would hold someone this long for some radio equipment. Perhaps they deserve the embargo. You do not even know what that equipment was: or can you read between the lines? Tell me then: I have got no insight whatsoever from that article except for a fancy program name that they have used for a cover! So you do not know but you believe Cubans are in the wrong here again: you are jut another brainwashed pawn as the next guy! This guy is a clown. We have BAD relations with Cuba and a SEVERE trade embargo. What did he expect to have happened? Alan Gross is a Jew. Evil Jews are good at suing people. ...And you, Jannai, are and evil bigot. Such is to be expected from someone like you with your obvious limitations, alan. You sound like another right-wing, Cuba hating, dimwitted Tea Partier. Are you one by any chance? Like Willie said already, we need to normalize relations with Cuba which is 50 years overdue!!! First of all, your sick of even saying such a thing, maybe you should trace your heritage and be deported to where ever that is. It was fault of the company in which he worked for for not giving him the informaiton he needed to know ahead of time, and his for being the mule. If it wasn't for the current U.S. idiotic policies toward Cuba, this man most probably wouldn't be lavishing in a Cuban jail right now. We need to normalize relations with Cuba and let bygones by bygones. This shows just how stupid the leaders in Washington are! Besides, I want to take a trip to Cuba myself and deeply resent this stupid government forbidding me to do so! Lavishing in a jail? Go look up the word, Willie. Better to.lavish than to languish!